YOUNTVILLE, Cali. – The trucking industry of late has attracted the attention of many so-called disrupters, looking to completely change how freight is delivered or the types of vehicles used to deliver it. But such stories are usually short on details, claims Matt Pfaffenbach, director of connectivity with Detroit, who was speaking today at a Detroit Connect Showcase press event. The Detroit Connect mobile app will be released later this year. Today’s trucks generate copious amounts of data, but Detroit is now taking steps to make that data more manageable and actionable for fleets. It is developing more tools to streamline and analyze data so that fleet managers are given only what they need to see to improve their operations. “Our customers need something which is of use to them,” said Pfaffenbach. He said Detroit has two goals. One is to create an “exceptional user experience.” This means better integration of telematics with the fleet’s operations. Its second goal is to be the “trusted source of data” among its customers. Lauren Attinasi, product strategy manager, connectivity, with Detroit, announced new ways the company plans to make data accessible and manageable for customers. One is a new Detroit Connect portal, which allows fleets to view data generated by their vehicles in easy-to-understand formats. It can also be used to remotely produce Detroit Diesel Electronic Control (DDEC) reports on vehicle performance. 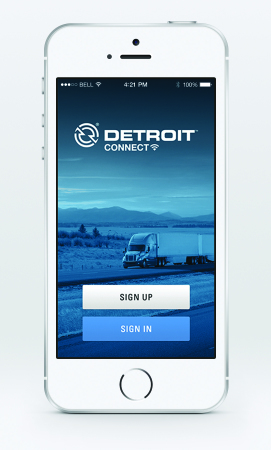 A new Detroit Connect web portal provides greater insight into truck-generated data. 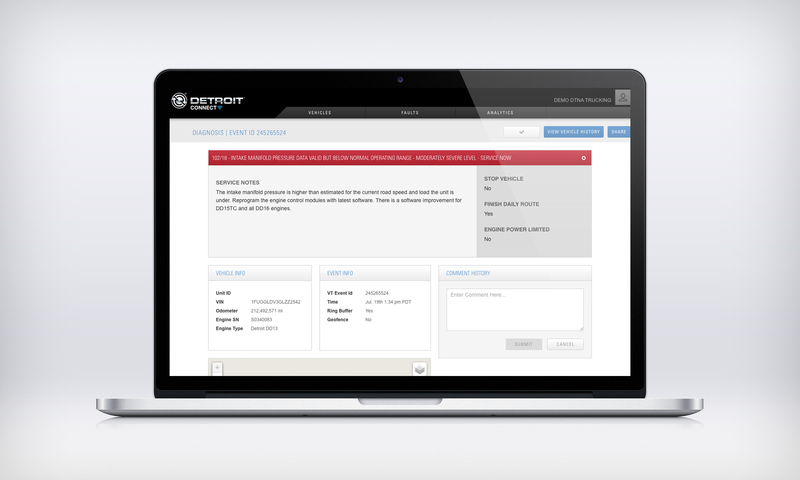 The new Detroit Connect portal also allows for the management of Virtual Technician remote diagnostics. It allows fleet managers to monitor vehicle health, to take deeper dives into fault codes generated by their trucks, and to measure driver and vehicle performance. Detroit has also created a new mobile app, which puts the same information into the fleet manager’s hands via a smartphone or tablet. An iOS version has already been built and an Android app is in development. Both will be released this fall. “The truck is now an active member of the team,” explained Attinasi, noting it interacts through the portal and apps with the fleet manager, maintenance manager, fuel manager, and safety officer. Jason Krajewski, manager, connectivity insight team with Detroit, said today telematics is generally event-based. It takes a snapshot of a value and provides some historical context, which may not paint the entire picture. Some hands-on data retrieval is still required. But soon, he said, data will be streamed over-the-air from the truck to the customer’s back office. It will be aggregated, cleaned and sorted in the cloud and distributed quickly on-demand, accessible to end users through web-based portals and apps. The vision, Krajewski added, is to take data off the truck and turn it into something useful for the company’s customers.